Two new collections hit the shelves this month (Collage & Waterfront Park) and they are running out the door faster than we can cut them. We are absolutely loving Collage, by Carrie Bloomston of Such Designs. The newsprint fabric, strips and cut-outs add great dimension and texture to any project. Love the birds, love the coffee mugs...love it all! In a classic Ode to Portland, Violet Craft for Michael Miller released Waterfront Park. There are birds...of course and bridges and beautiful cherry blossoms. All the sweet things that remind you of our big city sister to the northwest. We love it and hope you do too. Our new fall class schedule mailed out on Wednesday, August 7th and is also available online. Check out the wonderful assortment of quilting, sewing, knitting and crochet classes that have assembled for you this fall/winter. Explore our 2014 Workshops with Rosalie Dace, Gloria Loughman and Elizabeth Barton. In 2014 we have a twist to the Folk Art Retreat with Sue Spargo. She is co-teaching with her wonderfully, talented sister, Wendy Morris. We took the ever-popular Cranberry Chutney and put a "Kaffe" twist on it...and it turned out gorgeous! We have a special place in our hearts for Kaffe and just loved the way the florals/prints and shot cotton solids played off each other. We decided to KIT IT UP! Grab one before they are gone. We've joined the masses and started posting through Instagram. Follow us each day for instant postings and picture frenzied photo-ops of all the goodies that arrive in the shop. We will always let you know if it's up on the website...but feel free to call if you see something you like. #spquiltkits (we love to put our own spin on patterns and then kit them UP!) Watch as we release new kits each month. 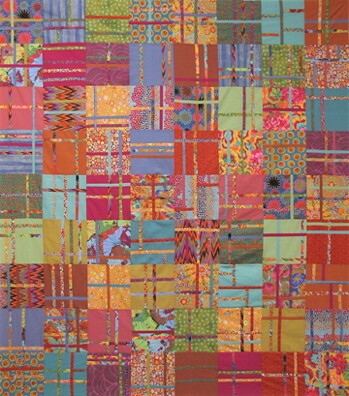 #spquickquilt (that's for the last minute quilter in you...you know who you are...these are fast, they're in a kit...GO!) New ones released each month. We love the homage to Portland, OR (being that it's our closest BIG city) with the steel bridges and birds and wonderful cherry blossom trees. We can't wait to play with it. We hope you have fun too.